Oh my, this is just wonderful!! And she looks just as beautiful in the dress as you did. The pictures are great. How cool that the dress in is good shape, except for a few tiny things. The last picture is so sweet! This dress looks a bit like my wedding dress. This made me all teary eyed, Linda. Your granddaughter is beautiful and looks like a princess in your dress. Your dress is beautiful too. I'm glad it has stayed so perfect for you. Time really goes so fast. 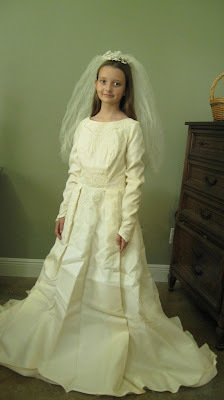 I think I will have to go into my archives and post a Throwback Thursday photo of my Granddaughter in my wedding dress. We were renewing our vows and had the dress as part of the decor. Lauren wanted to try it on too. Ok, I think I will go do that right now. What a sweet photo of grandpa kissing Charlie. What a sweet story and happy tears would have been mandatory. I guess that cleaner did a decent job and how sweet that your grand wants that to be her wedding dress. 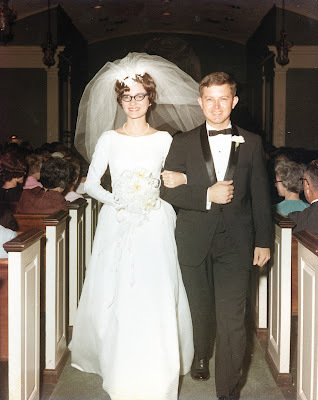 You two were adorable 49 years ago and are still cute today. This is very, very sweet! I loved seeing your almost 49 year old photo and also the ones of your granddaughter in the dress. Bob and I will celebrate our 50th in August, and we searched and searched to find where we had stored our wedding album. Finally, today we rescued it, and have been smiling at those old photos ever since. Good luck with that not dating until you are age 36. You sure picked a true gallant to marry. What a delightful story and enjoyed the pictures. Ah, dressup time! Thanks Linda for the kind remarks just now on my blog. Steve really is an awesome person. He constantly makes lemonade out of the lemons tossed his way. 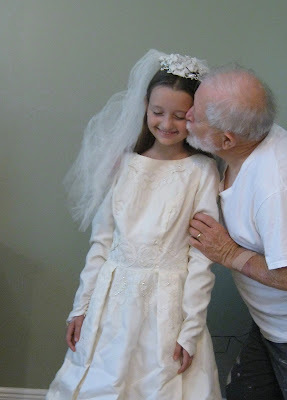 By the way, did you see the photos on my blog with my Granddaughter in my wedding dress? Its a few posts back from the birthday one. AWWWWW, what a sweet post! My gown is buried in a trunk in the attic. I can't climb up there, so it will remain until I remember it on a cool day and get one of the grands to go after it. I am sure it will not be in as good a shape as yours though! Your granddaughter is adorable and the last shot should be saved to put in her wedding album. Such a beautiful photo of your granddaughter dressing up in dreams - yours and hers. What a sweet, sweet story. I loved the photo of you, but the one of your granddaughter, now that is a real heart tugger. I'm glad you saw her in this dress while she was still young and awestruck and oh so innocent. I hope much of that remains until she dates at 36. What a wonderful entry and dress. I teared up too. So glad to see you again. This is very touching. How lucky that it survived and helped create this moment. Wish I had your email address so we could stay in touch. The answer is YES, my Granddaughter has the sweetest spirit , is so smart, funny and a joy to be around.